Stockport based Hughes Safety Showers welcomed a surprise Royal visitor to the Company’s stand at the Abu Dhabi International Petroleum Exhibition (ADIPEC). 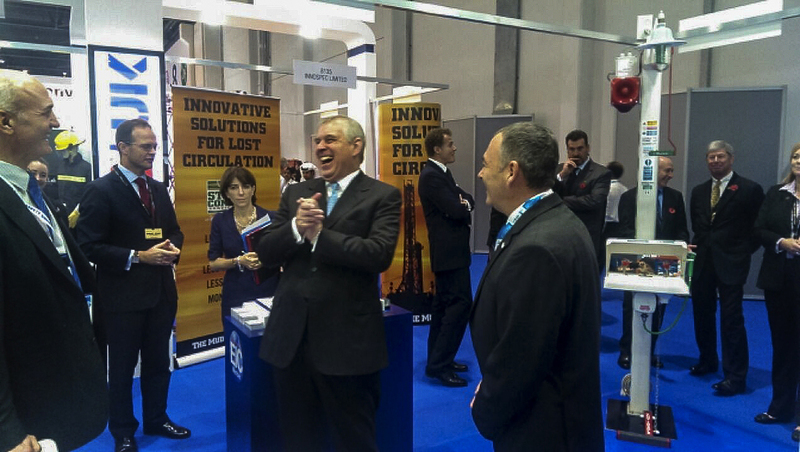 His Royal Highness Prince Andrew, Duke of York, is the UK's Special Representative for International Trade and Investment and gave an opening address on day two before touring the exhibition. Visiting the Hughes stand, he spent time with MD Tony Hughes and Group sales director Paul Darlington discussing some of the issues British companies face when selling abroad. He was also interested in the company’s history, products and two Queen’s Awards for Exporting. He was surprised to learn that even Buckingham Palace has a Hughes Emergency Safety Shower. "When we take part in exhibitions around the world we are not only promoting Hughes but we are flying the flag for Britain,’ says Tony Hughes.